Jessica Lá Rel is coming to Minneapolis for a one night only intimate concert as part of her tour, The Sit In. The Sit In is a national concert series in line with the historic sit in demonstrations of the Civil Rights Movement, using music and storytelling to take up necessary space, confront injustice, and forge radical love. Following the rise of her latest ep f(lux), Jessica Lá Rel is touring the country with her powerhouse vocals and soulful music about love, life, and justice. Kick off your weekend with an intimate house concert over sunset with Lá Rel. Good Music and #GoodVibesOnly. Our own Niles, CEO/ Founder of The Avant Garde, LLC will be the opening act on August 17 at 7pm. 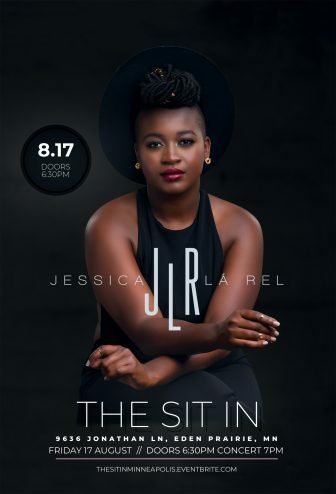 The Sit In concert with Jessica La’ Rel is going to be an exciting and entertaining event. Come support these fabulous young singer/artist.